In early 2002, amid the growing optimism surrounding the United States’ Operation Enduring Freedom in Afghanistan, I heard on the radio an U.S. official claim that the United States’ nation-building efforts should strive to transform Kabul into Zurich. The statement struck me as preposterous and perplexing. How would the United States achieve this? More importantly, why would the United States try to do so? The implicit historical narrative in the comparison captivated me, too. Zurich, the speaker implied, represented a more “modern” form of city; Kabul, something less so. Yet with the right mixture of foreign aid and expertise, the U.S. official suggested that outsiders could engineer a developmental transformation in which a war-torn Afghan city could be made to resemble the Swiss high-tech financial hub. A decade and a half later, however, Kabul remains Kabul. The U.S. official’s optimistic goal rests on the long list of frustrated developmental aspirations and nation-building dreams that have peppered U.S. foreign policy in the past. Thankfully, though, as Joe Hodge’s magisterial historiographical narrative reminds us, in the same time that the United States has struggled to develop Iraq and Afghanistan we have begun to learn much more about this long history. Hodge’s essays offer an insightful narrative of how the scholarship on development history—writing development as history—has evolved. He notes that many current historians took inspiration from efforts of anthropologists and political scientists in the 1990s—scholars such as James Ferguson, Arturo Escobar, and James Scott—who linked development ideologies and discourse to the exercise of power (usually state power). They produced an altogether damming portrait of development as top-down, technocratic, and imperialistic. Historians added depth and nuance to this literature. Initially, scholars working in the history of science, technology, and medicine and on the intellectual history of modernization theory in the social sciences showed how and why development theories influenced U.S. foreign policy towards the Third World. From there, historians moved the story backward through time, establishing important continuities with late colonial practice (as Hodge’s own research shows). They also provided richly detailed case studies of development in action around the world. Finally, historians demonstrated that development is far more than from a story of what the United States or the West simply “did” to other peoples, too. International development is now rightly understood as a global phenomenon, one in which people at all levels – from Third World villages and nationalist movements to MIT economists to policymakers in Washington, London, Delhi, and Moscow – exercised power, though to differing degrees and variegated purposes. Whereas the early historicists often told a totalizing story, historians added context and subtlety. The great contribution of all this scholarship – and Hodge’s essays here – is to mark the history of international development as one of the most important themes of twentieth century global history. Hodge’s analysis provides an excellent opportunity to reflect more deeply into what historians for development might do next and what we might have to say to those out there “in the field” and policy world now. In what follows, I build on Hodge’s analysis by suggesting some ways in which historians might continue their research and then reflect a bit more on what historians might contribute to development policy today. Although Hodge is right to praise recent efforts to move the history of development beyond the history of U.S. foreign aid and nation-building policies, historians of development might also benefit from more deeply incorporating the United States’ domestic experience as part of international development history. After all, the United States did not just try to develop the rest of the world. It also experienced many shifts in developmental visions at home. Recent scholarship suggests three ways we might explore this theme further. For one, we might compare and analyze various strategies for U.S. domestic economic development, such as those Brent Cebul writes about in a forthcoming monograph, with the international experience at the same time. Second, we can trace the “boomerang” effects of development experts who travel abroad and return home to take their ideas and experience and try to graft them on to American domestic experience, as Daniel Immerwahr has shown in his study of community development abroad and at home. Finally, we might better place domestic American visions for “developing” various populations – as Alyosha Goldstein has done – as part of a broader comparative or transnational framework. Altogether, we could represent the United States’ history as an object and agent of developmental change, open it up for potentially fruitful comparative analysis, and pay close attention to the porousness of the intellectual boundaries of who counts as “underdeveloped,” be they in South Sudan or the South Side of Chicago, in the minds of would-be developers. In addition, we might further explore the disjunctures, anxieties, fractures, and fights among experts over the ultimate meaning and purpose of development itself. Hodge points out that “deeper” histories of local development projects revealed that development was never as hegemonic as its anthropological critics implied. Going even further, though, historians have begun to show that even in times of supposed consensus development thought was heterogeneous and punctuated by crises of faith within the expert community. On the first point, Daniel Immerwahr analyzed, for instance, how communitarian impulses coursed through foreign aid agencies and national governments just as modernization theories were beginning to take hold. Michele Alacevich, too, demonstrated that the early years of the World Bank contained quite a few distinct approaches to development. As for times of crisis, historians have just begun to explore the upheavals of development thought and practice during the 1970s. 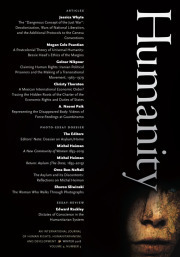 I’ve written about environmental critiques of international development during that time, and there is wide room to investigate further how criticisms from the 1960s onward about environmental decline, gender and the role of women in development, the turn towards poverty eradication and “basic human needs”, the need to create a more equitable global economy, the collapsing faith in state-led planning and the valorization of entrepreneurialism and market-based mechanisms, the aspiration to unlock the “capabilities” of all human beings, and the criticisms of economic knowledge and measurement as models and assessment tools all led to confusion and anxiety among development experts. In all of these debates, experts questioned both the means and ends of development interventions. Historians would do well to investigate more deeply these debates to understand better the many ways in which experts have defined the ultimate objective of development and the most desirable paths to get there. More broadly, Hodge’s two essays raise many important points about how this growing historiography of development might inspire us to reframe long-standing narratives in the twentieth century. Hodge convincingly shows that development history can help us make connections between the imperial/post-imperial divide and move beyond the Cold War framework. In addition, historians might also explore further how new categories of governance and power reshaped the everyday practice of governing in the twentieth century. Focusing on the place of “economic growth” as developmental imperative provides one such line of inquiry. The pursuit of never-ending economic growth defined in terms in statistical aggregates transcended the ideological divisions (capitalist/communist, liberal/conservative, statist/neoliberal) that so often still divide our studies of the previous centuries. All countries embraced economic growth as a policy goal in the twentieth century, and as David Engerman has written, Gross National Product (GNP) became the yardstick by which countries measured their relative success. That had tremendous effects for social relations, governmental authority, international politics, income distribution within countries, and not least, the global environment and climate. If we are to begin to understand human beings as “geological agents,” as Naomi Oreskes and Dipesh Chakrabarty has encouraged historians to do, thinking of the twentieth century as the development and growth century is a good starting point. International development history, because of its transnational, global, and multi-perspectival character, promises to hold powerful insights into how and why the development century emerged and what it has wrought. As scholars continue to explore the history of international development ideas and practice, there is certainly room, as Hodge suggests at both the start and conclusion of his essays, for them to contribute to development policy. But historians should also be wary about our scholarship being too quickly reduced to potted “lessons” that practitioners might pluck to serve contemporary desires. We might achieve this and still contribute productively in a few ways. First, historians might explore other analytical frameworks for critiquing development projects and policies. Development interventions have largely taken the form of the “project” or “program,” which grafts a degree of coherence and artificial sense of closure that cannot match with the dynamism of historical change. In official rhetoric, experts often explain such endeavors as either “successes” or “failures.” Doing so, however, presupposes a clear beginning and end point from which to assess a project. As any environmental historian or environmental anthropologist would suggest, grand schemes, to paraphrase Anna Tsing, never fully colonize the objects of their intervention. Take, for instance, Nick Cullather’s history of the ill-fated dam-building efforts in Afghanistan during the 1950s. In the typical short-term view, the projects might have been considered a success had they been analyzed at the end of their funding cycles. Though observers at the time might have contested such a conclusion, from a longer perspective the unintended consequences of these projects defy such neat a narrative. The dams waterlogged the soils around the Helmand River Valley, raising alkali and salt levels, which in turn made it difficult to grow the wheat American experts envisioned as staples for their larger developmental goals. Over a period of decades, long after the typical project assessment period had ended, those same soils, so intolerable to most crops, became suitable for opium and little else. The Taliban, a group that lay far beyond the vision of any planner in the 1940s, was able to seize on this evolved terrain and leverage it for their own developmental and state-building purposes. This example of the co-evolution between humans and the non-human environment is hard to see when viewed in the typical development timeline for proclaiming a “success” or “failure.” Part of the historian’s toolkit is the ability to show how this evolution defies a simple narrative that views a project’s life too narrowly and mandates any developer prepare for changes on a wide range of spatial and temporal scales. Second, historical analysis, as Hodge alludes to here, can help development practitioners better understand how they use their own history to justify, explain, and implement their current policies. A quick glance at Rockefeller Foundation reports on the Green Revolution, for instance, tell a very different history than do Nick Cullather or John Perkins. Whereas the Foundation’s short history is a heroic tale of scientific knowledge and enlightened leadership, Cullather and Perkins expose political conflicts and narrow security imperatives, poorly applied and flawed models, and hubristic planners. Reckoning with such historical analysis might enable Rockefeller Foundation to rethink the nature of its interventions and better understand the various short and long-term effects of its programs. Finally, historians can challenge reductive historical analogies in favor of rigorous historical thinking. In the lead-up to the United States’ occupation of Iraq, Bush administration officials pointed to the United States’ past development and nation-building experiences, such as post-war Japan. Historian John Dower persuasively argued, however, that Iraq in 2003 was not much like Japan in 1945, and it was foolhardy to extract overgeneralized lessons from that analogy (though his warnings went unheeded). Historians can gauge the accuracy of the stories development experts tell themselves. When their stories do not make for sound history, we can explain why and point to better methods and richer stories. Along these lines, too, historians can provide richer contextual analysis of specific cases over vast histories that single out a specific “variable” – property rights or a resource “course”—to solve a presently defined developmental problem. Such thoughtful appreciation of context and historical change may not point to simple silver-bullet solutions that developers often promote. Yet it can help practitioners avoid worse outcomes. Minimizing damage and managing expectations can often be just as important as embarking on a massive project sustained by quixotic hopes. All of this takes me back to the U.S. official who looked at Kabul and envisioned a future Zurich. The historians whom Hodge cites – and the many more now working on international development issues – have much to say to officials who would proffer such simplistic, misguided stories. They can explain where such a faith in development efforts comes from, which ideas and assumptions sustain it, and how strong beliefs can be poor guides in critical moments. Historians can point out, too, how such transformations are not necessarily “doomed to fail,” but require thorough consideration of political, economic, environmental, cultural, and historical context. The historian can offer a more robust and reasonable set of comparisons and frameworks for analysis than thin analogies or quick comparison between two cities. A historian might even advice against any such a priori model-making in favor of deeper engagement with a wide range of available sources. Policymakers may not want to heed such cautions nor embrace such advice, but that does not discredit the power of such critical reflection. Hodge’s essays show scholars have learned much about development by analyzing it as history. Hopefully, as this scholarship continues to deepen and broaden, others will, too. Brent Cebul, The American Way of Growth: Business, Poverty, and Development in the American Century (Philadelphia: The University of Pennsylvania Press, forthcoming). Daniel Immerwahr, Thinking Small: The United States and the Lure of Community Development (Cambridge: Harvard University Press, 2014). Alyosha Goldstein, Poverty in Common: The Politics of Community Action during the American Century (Durham: Duke University Press, 2012). Michele Alacevich, The Political Economy of the World Bank: The Early Years (Stanford: Stanford University Press, 2009). Stephen Macekura, Of Limits and Growth: The Rise of Global Sustainable Development in the Twentieth Century (New York: Cambridge University Press, 2015). See, for instance, Matthias Schmelzer’s new book on the OECD. Matthias Schmelzer, The Hegemony of Growth: The Making and Remaking of the Economic Growth Paradigm and the OECD, 1948 to 2010 (Cambridge: Cambridge University Press, 2016). See also Timothy Mitchell, “Economentality: How the Future Entered Government,” Critical Inquiry, no. 40 (Summer 2014), 479-507. David C. Engerman, “Bernath Lecture: American Knowledge and Global Power.” Diplomatic History, Vol. 31, No. 4 (September 2007), 620-21. The socialist world, of course, had its own aggregate metric: net material product. Western economists often tried to calculate Soviet economic growth in terms of GNP, although these efforts required tremendous guesswork. On climate change and history, see Dipesh Chakrabarty, “The Climate of History: Four Theses,” Critical Inquiry, Vol. 35 (Winter 2009), 197-222. Anna Tsing, Friction: An Ethnography of Global Connections (Princeton: Princeton University Press, 2005), 36. Nick Cullather, “Damming Afghanistan: Modernization in a Buffer State,” The Journal of American History, Vol. 89, No. 2 (September 2002), 512-37. See, for instance, The Rockefeller Foundation’s centennial celebration website: http://www.rockefeller100.org/exhibits/show/agriculture. Nick Cullather, The Hungry World: America’s Cold War Battle Against Poverty in Asia (Cambridge: Harvard University Press, 2011); John H. Perkins, Geopolitics and the Green Revolution: Wheat, Genes, and the Cold War (New York: Oxford University Press, 1997). Stephen Macekura is Assistant Professor of International Studies at Indiana University, Bloomington. He received a Ph.D. in history from the University of Virginia in 2013, and then was a post-doctoral fellow at the Institute, where he continues to serve as the associate director of the Program on Culture, Capitalism, and Global Change. In 2014-2015, he was a post-doctoral fellow at the Dickey Center for International Understanding at Dartmouth College. Macekura's first book, Of Limits and Growth: The Rise of Global Sustainable Development in the Twentieth Century (Cambridge University Press, 2015), analyzes how environmental NGOs struggled to implement environmental protection measures in the developing world in the 1950s and 1960s and then critiqued and reformed the development policies of the U.S. government, World Bank, and UN system in the 1970s and 1980s. He is currently researching for his second book project. It explores various critiques of economic growth since the 1960s by revealing how reformers have challenged and sought to rethink the ways in which the concept of “growth” has been defined, assessed, and measured.